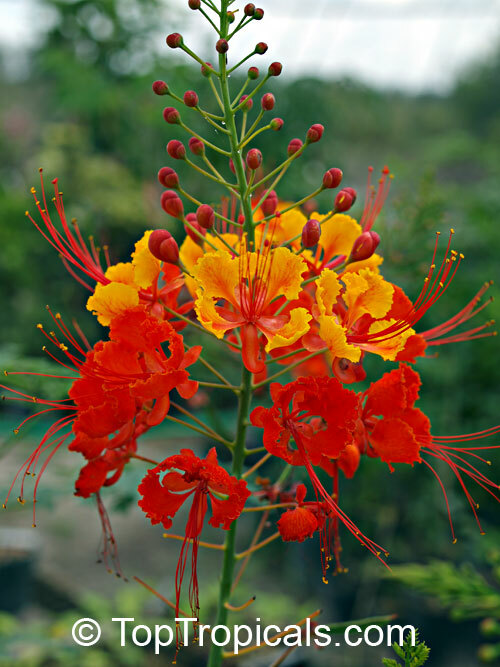 Peacock flower lives up to its name with incredibly showy blossoms of orange and red. 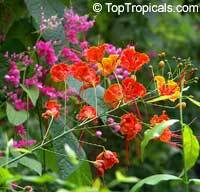 The striking flowers are an attention grabber! Evergreen shrub or small tree in frost free climates, a deciduous shrub in zone 9, and a returning perennial in zone 8. 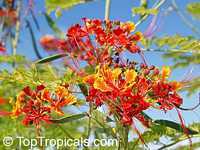 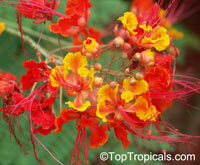 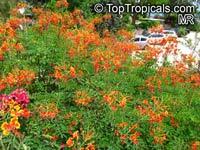 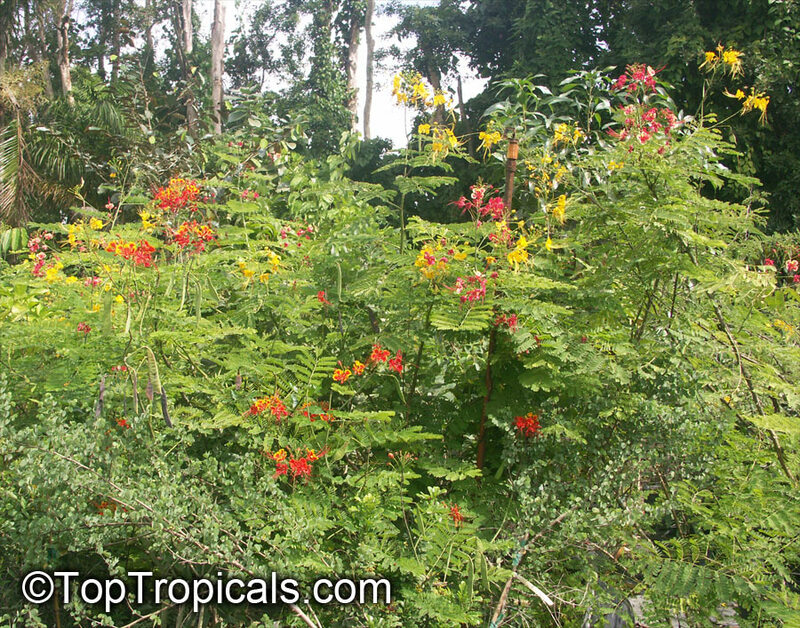 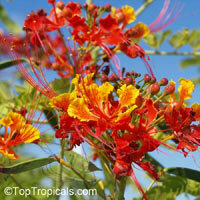 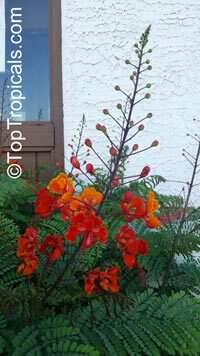 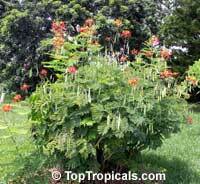 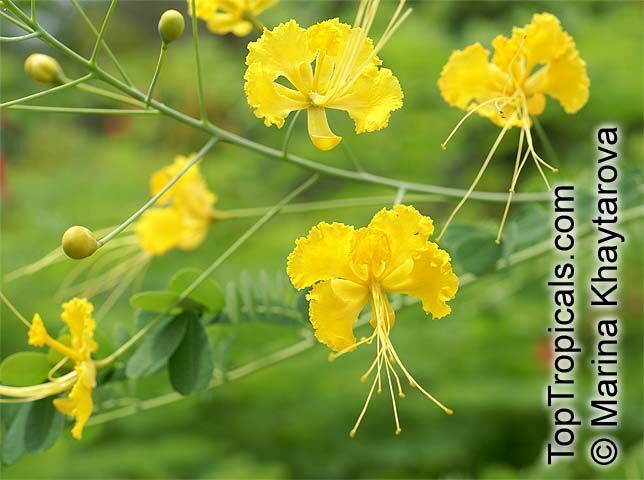 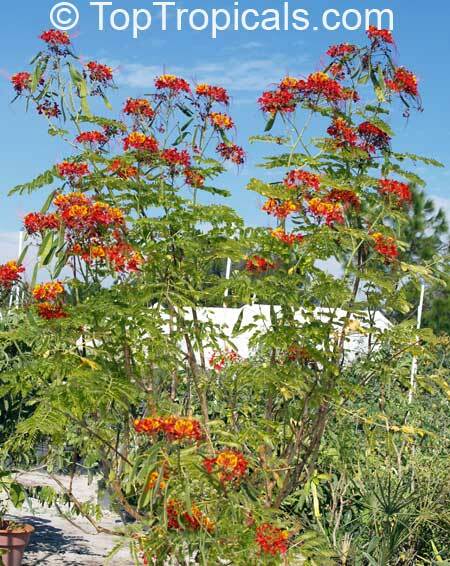 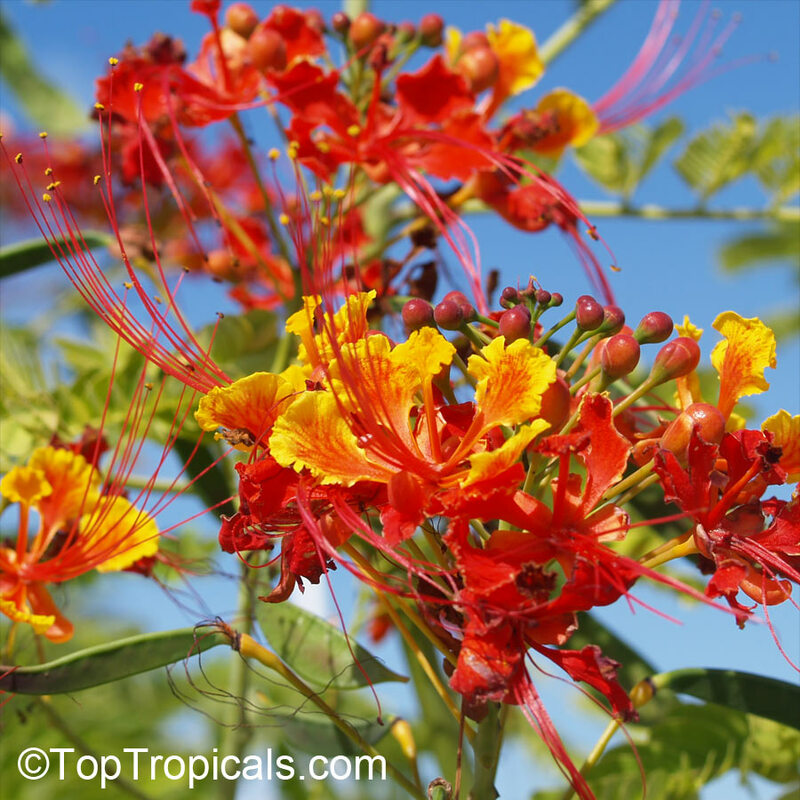 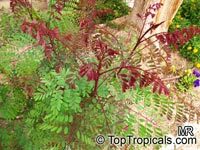 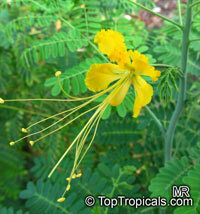 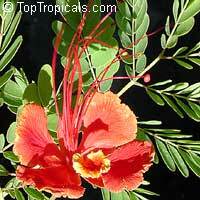 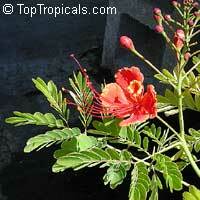 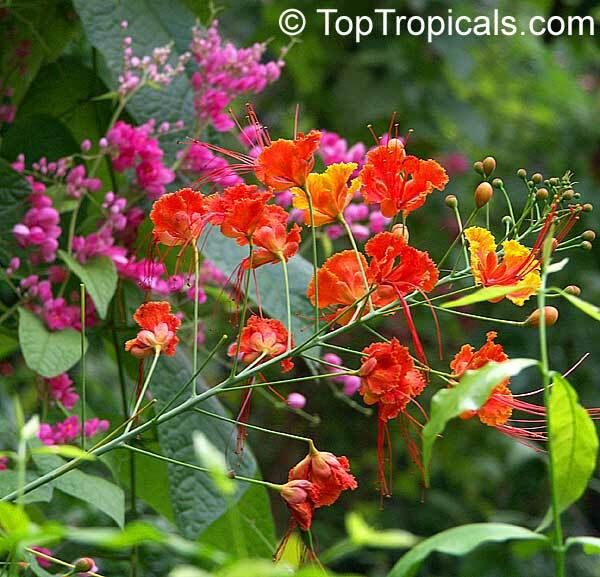 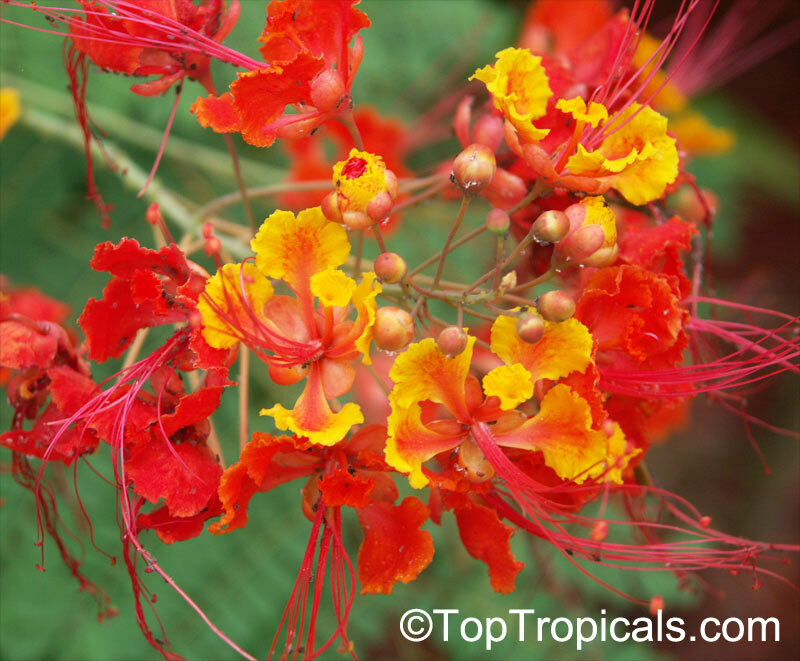 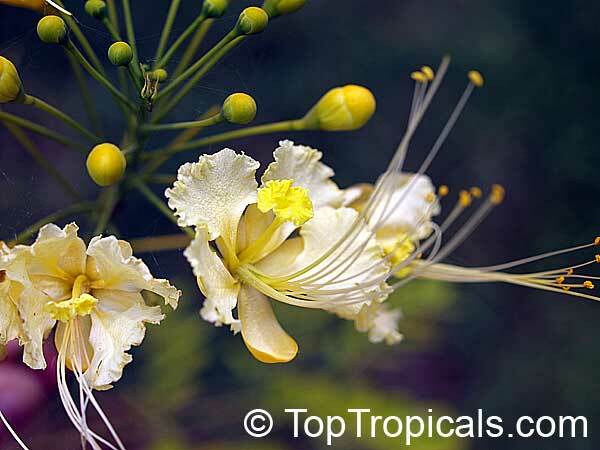 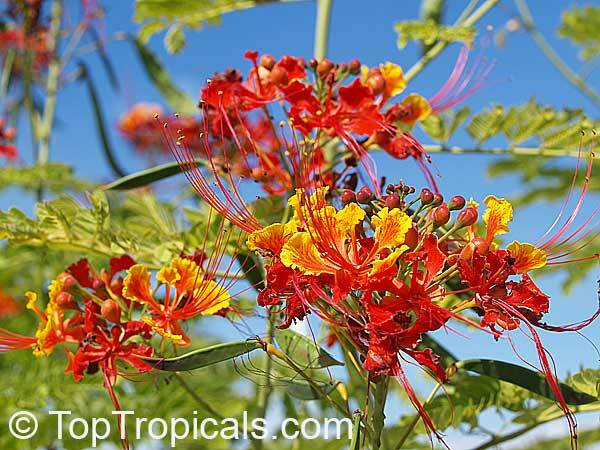 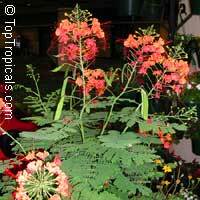 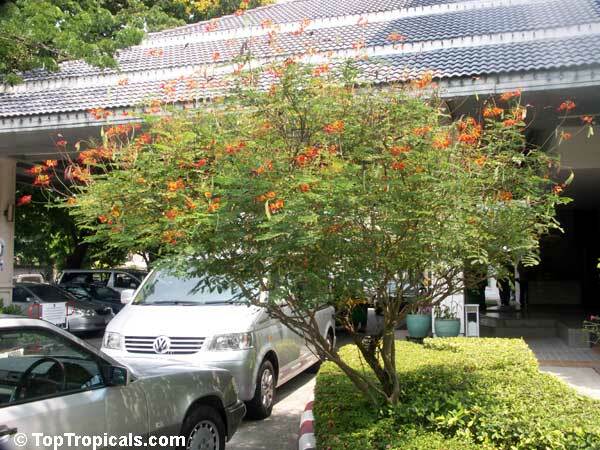 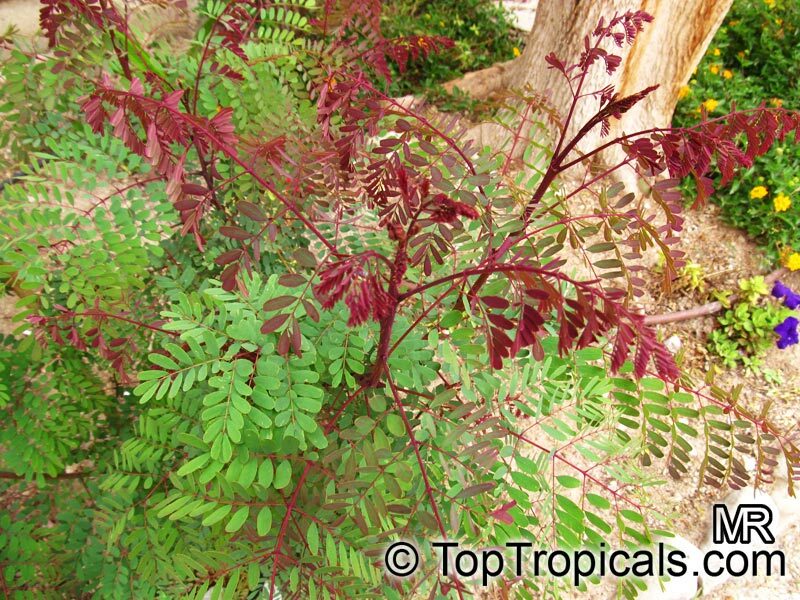 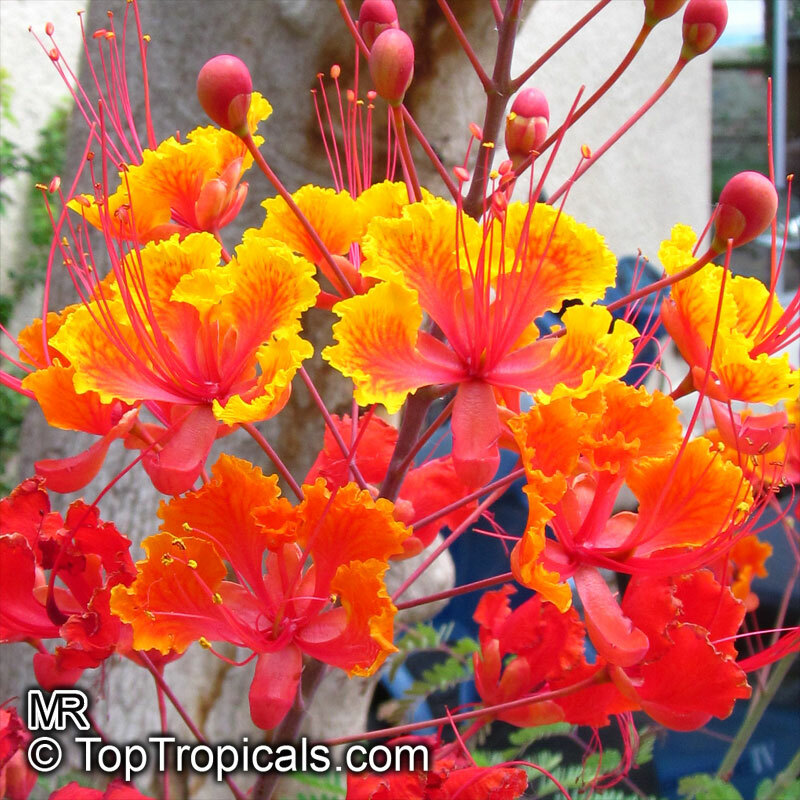 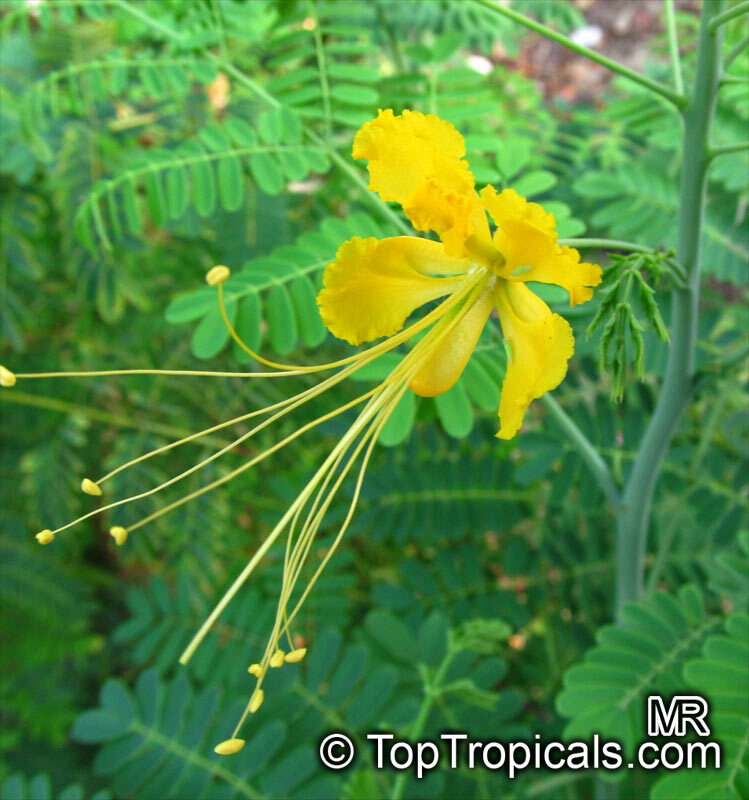 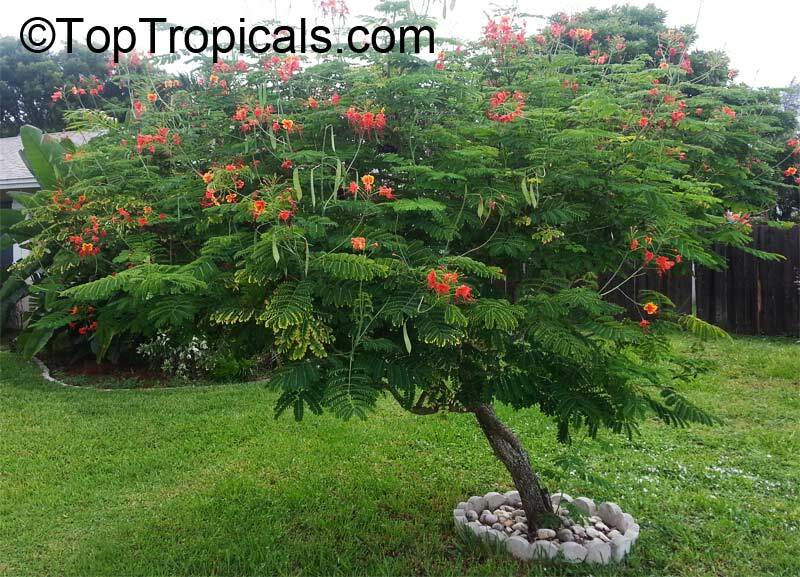 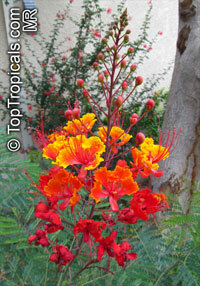 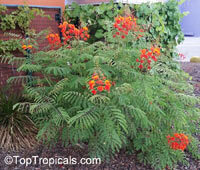 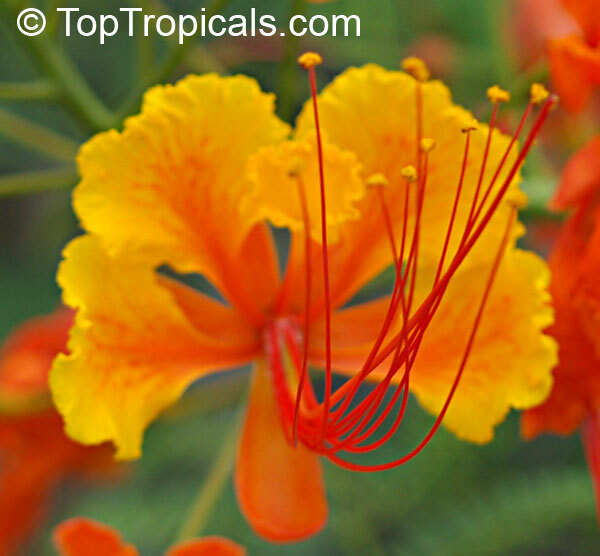 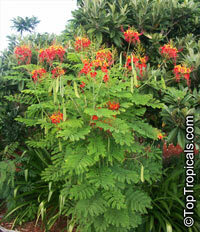 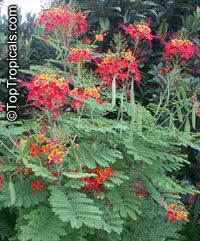 In the tropics it gets 15-20' tall and its ungainly, wide spreading branches can cover about the same width. 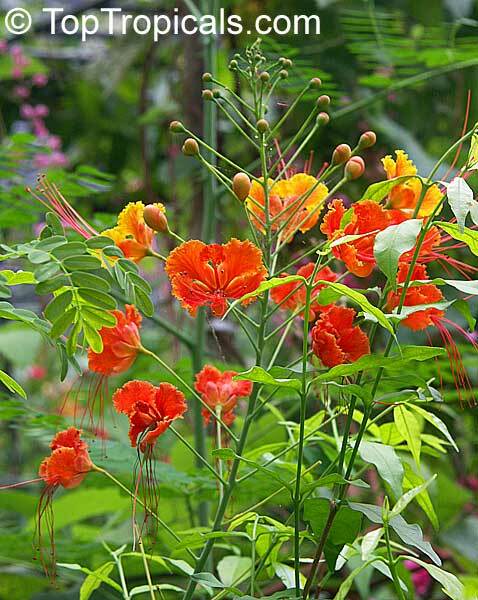 In cultivation the peacock flower is usually 8-12' tall, growing that large even after freezing to the ground the previous winter. 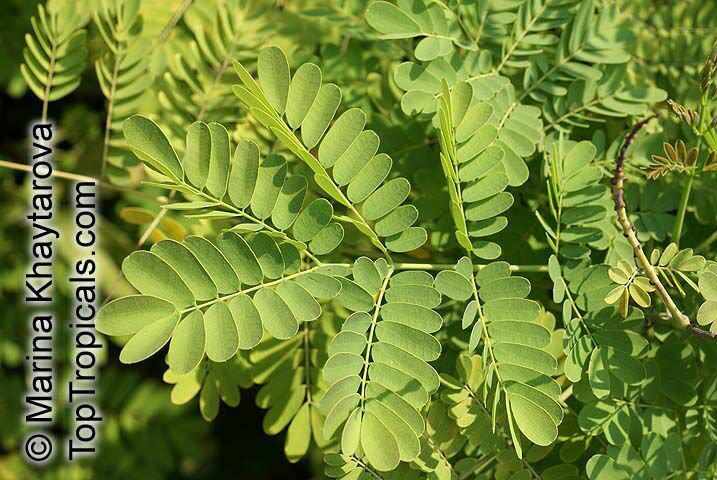 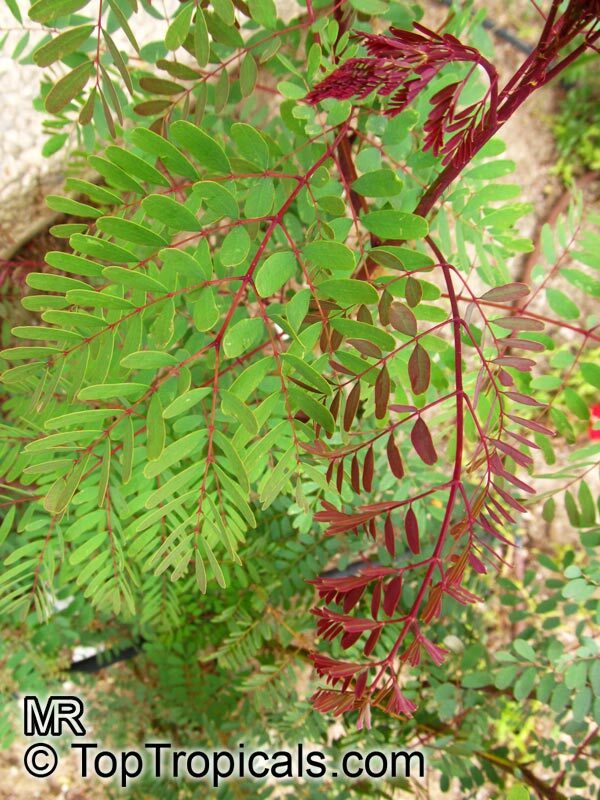 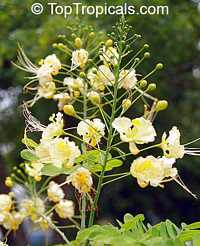 The stem, branches and petioles are armed with sharp spines and the leaves are fernlike and twice compound, with many small, oval leaflets. The flowers are bowl shaped, 2-3" across, with five crinkled, unequal red and orange petals, and ten prominent bright red stamens that extend way beyond the corolla. 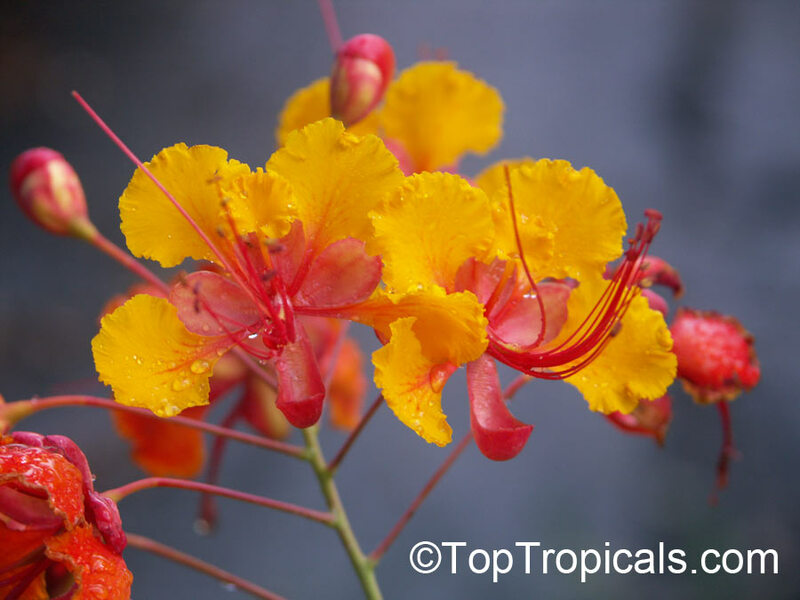 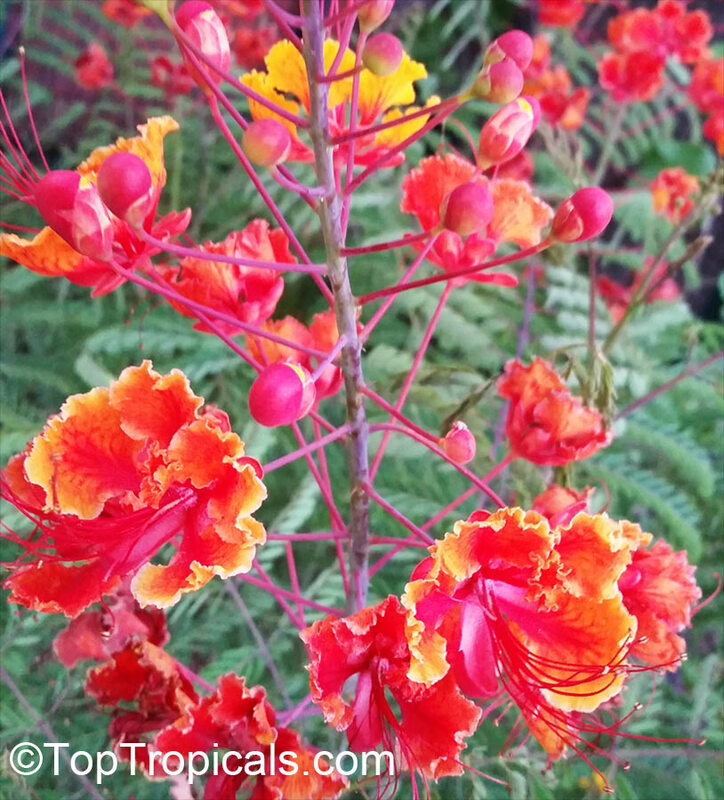 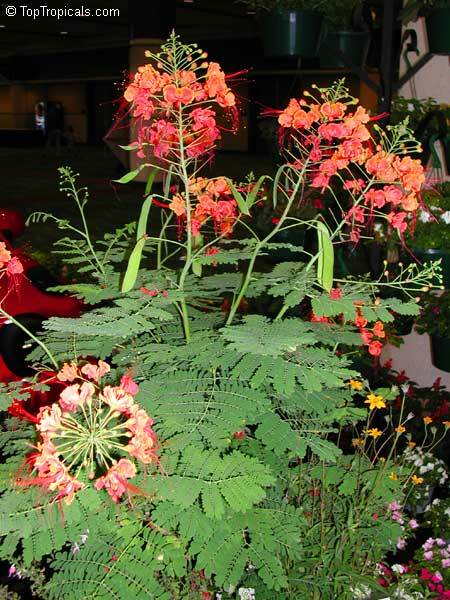 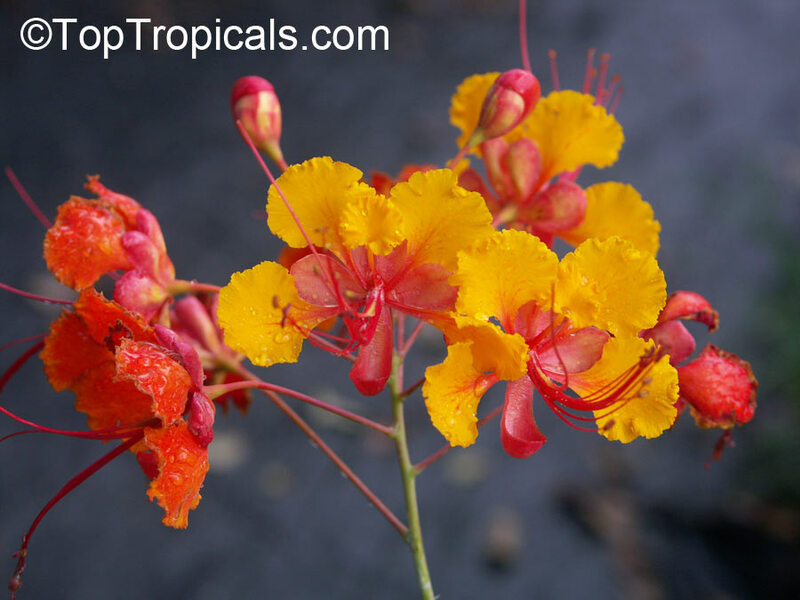 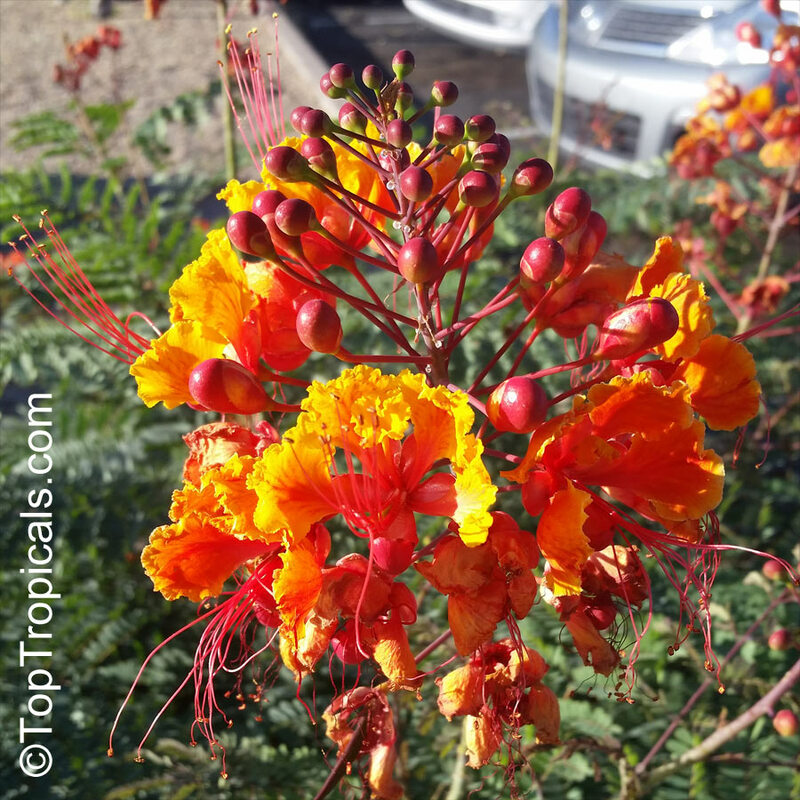 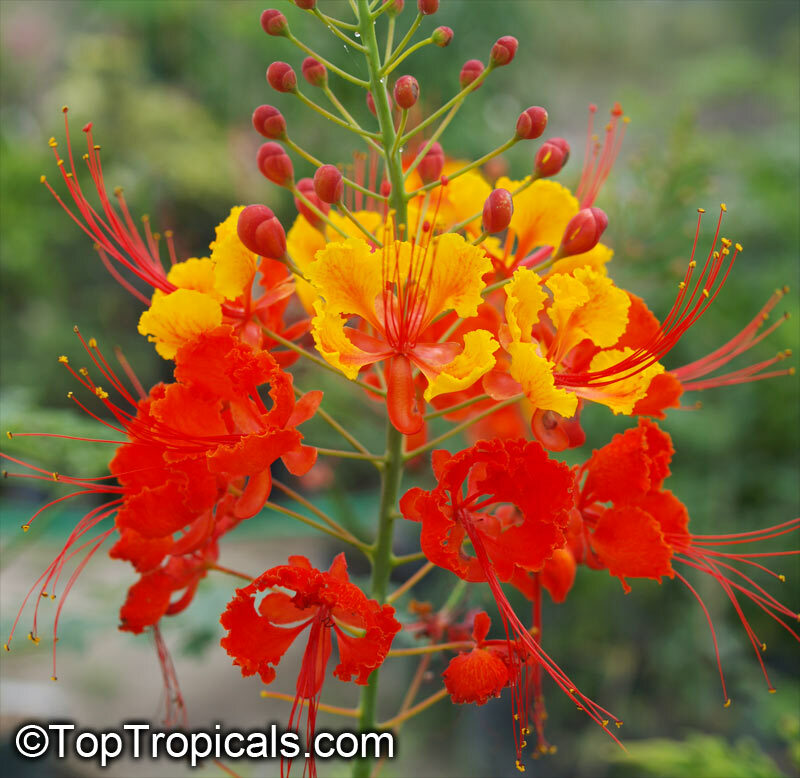 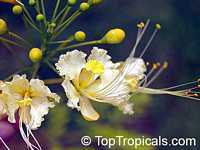 The flowers are borne in terminal clusters 8-10" tall throughout most of the year in tropical climates and in late summer and fall where frosts occur. 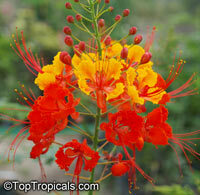 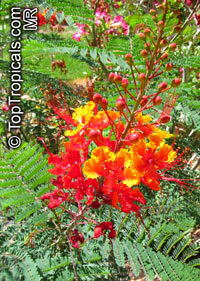 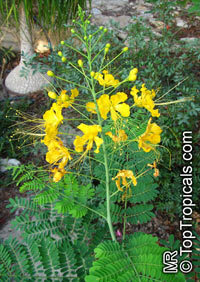 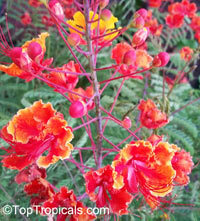 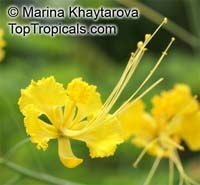 There also are forms with yellow and forms with dark red flowers. 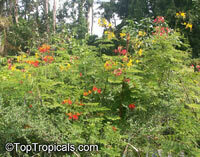 The fruits, typical legumes, are flat, 3-4" long, and when ripe they split open noisily to expose the little brown beans. 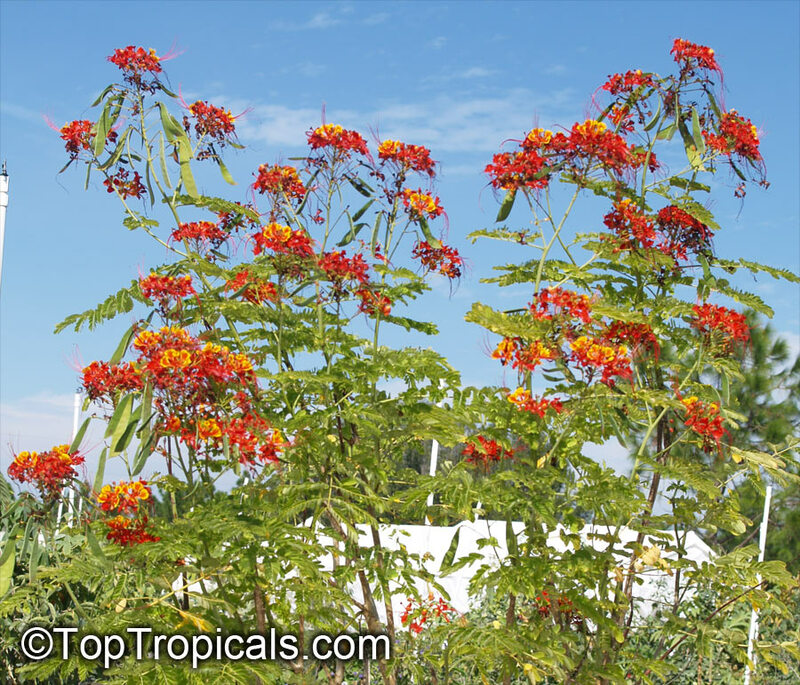 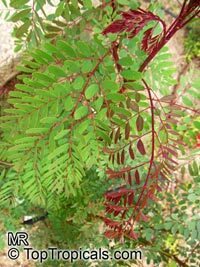 Very easy to grow in alkaline to acidic, well-drained soils. This is a fast growin plant. 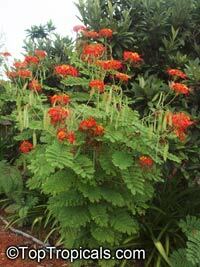 It is moderately tolerant of salty conditions. 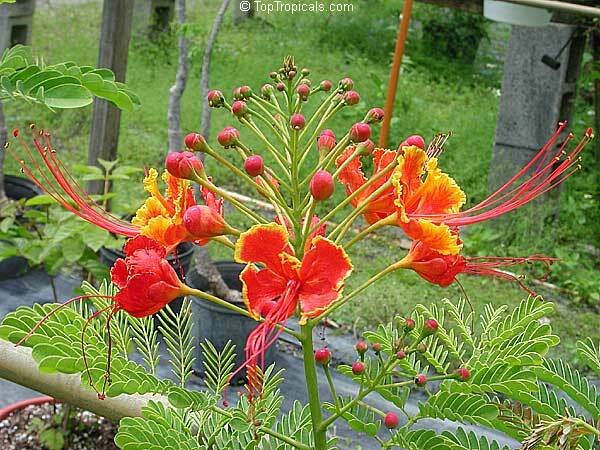 Peaccock flower benefits from pruning, and can be shaped to tree form or shrubby bush form. Use peacock flower as a specimen or in a mixed shrub border. 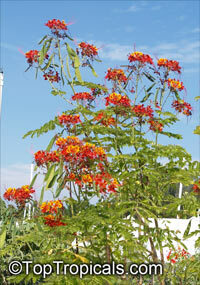 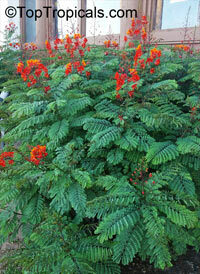 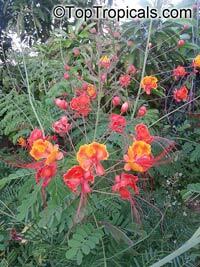 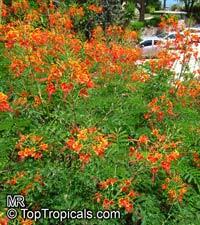 It has an open, spreading habit and the branches sometimes get too long for their own good and break off. 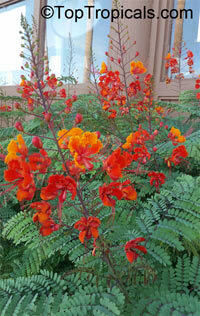 Still, a line of peacock flowers makes a showy fine-textured screen or informal hedge. 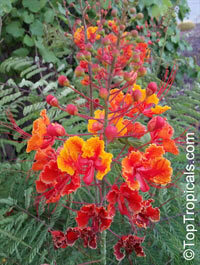 You can cut peacock flower to the ground in late winter or early spring to get a bushier, more compact shrub. 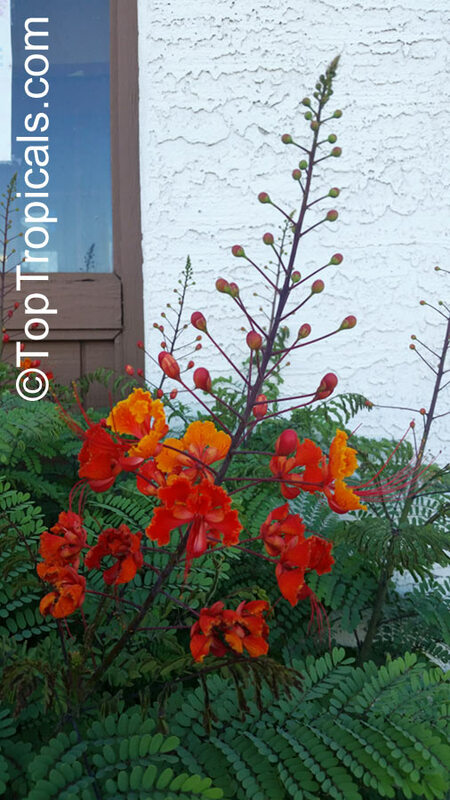 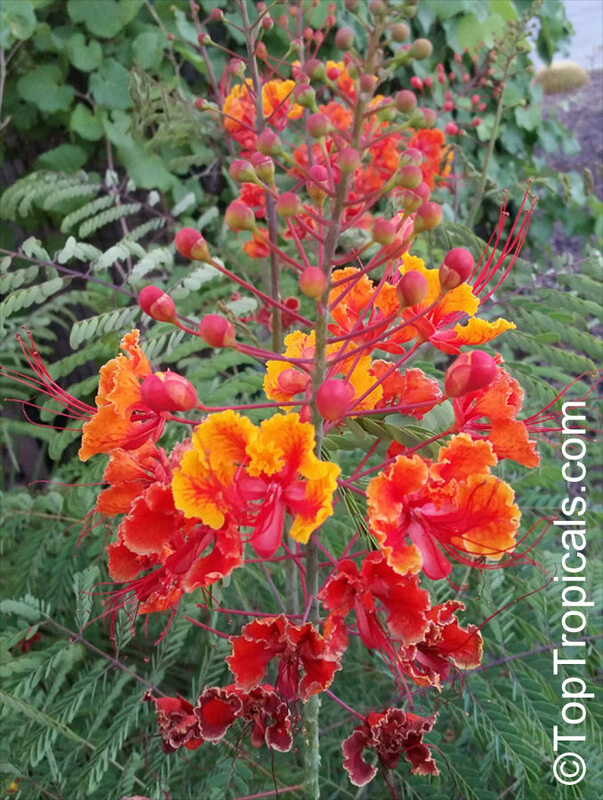 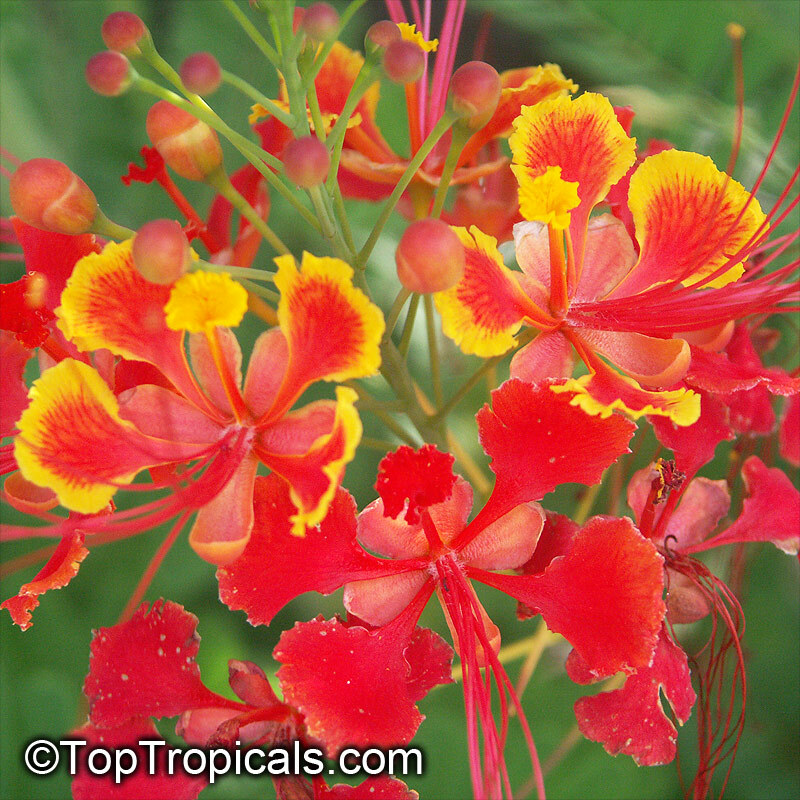 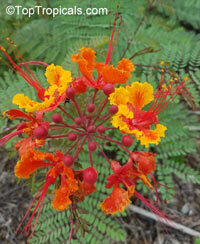 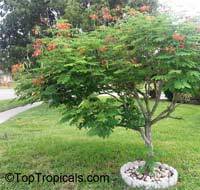 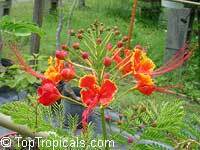 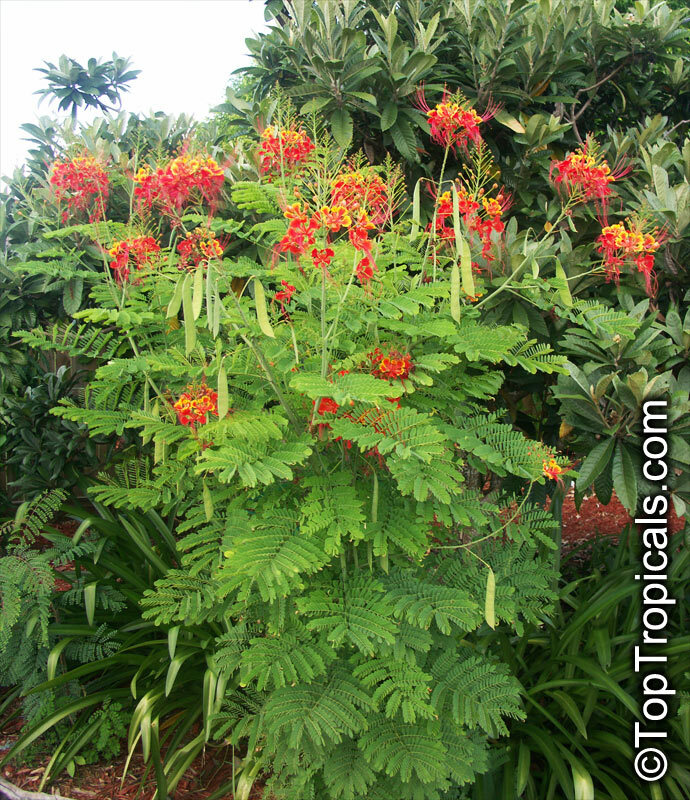 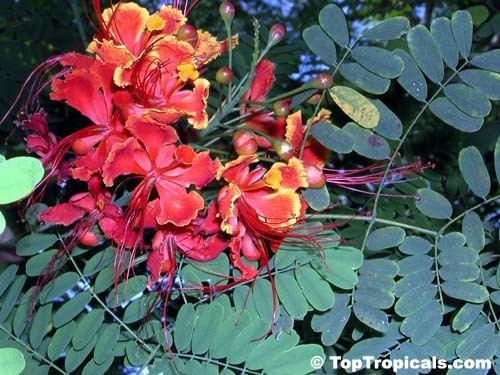 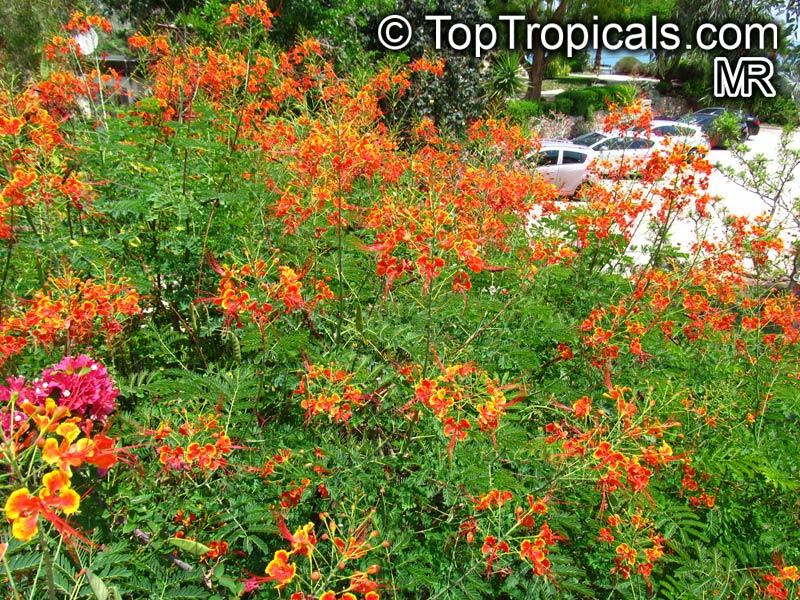 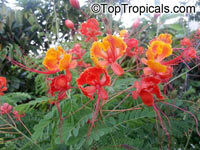 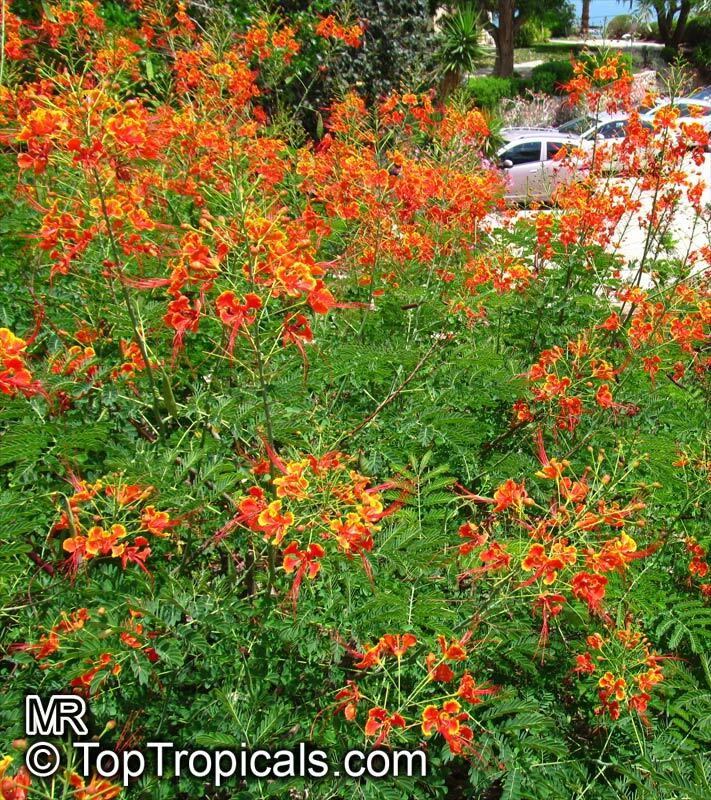 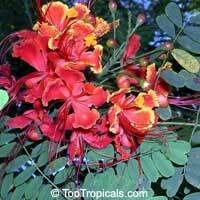 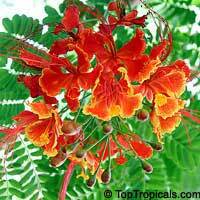 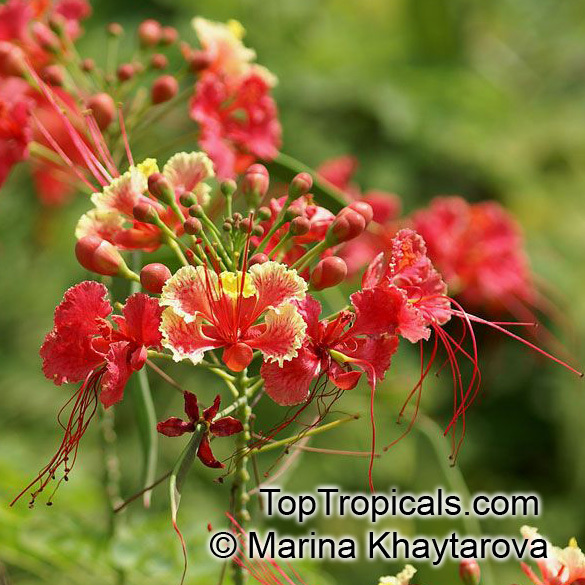 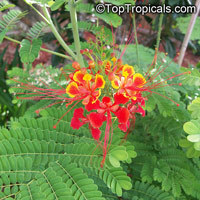 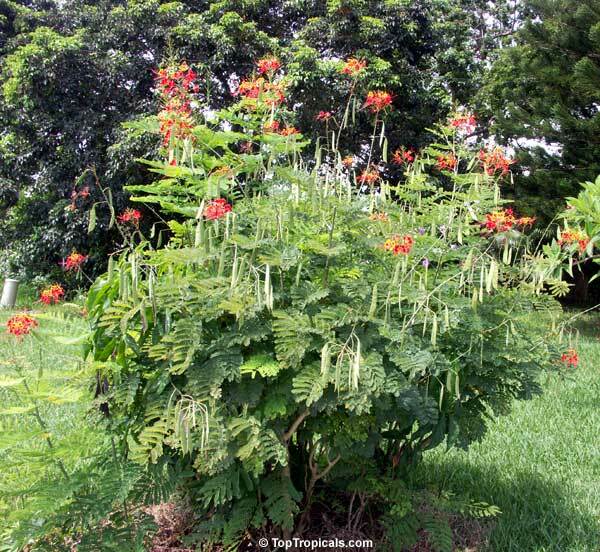 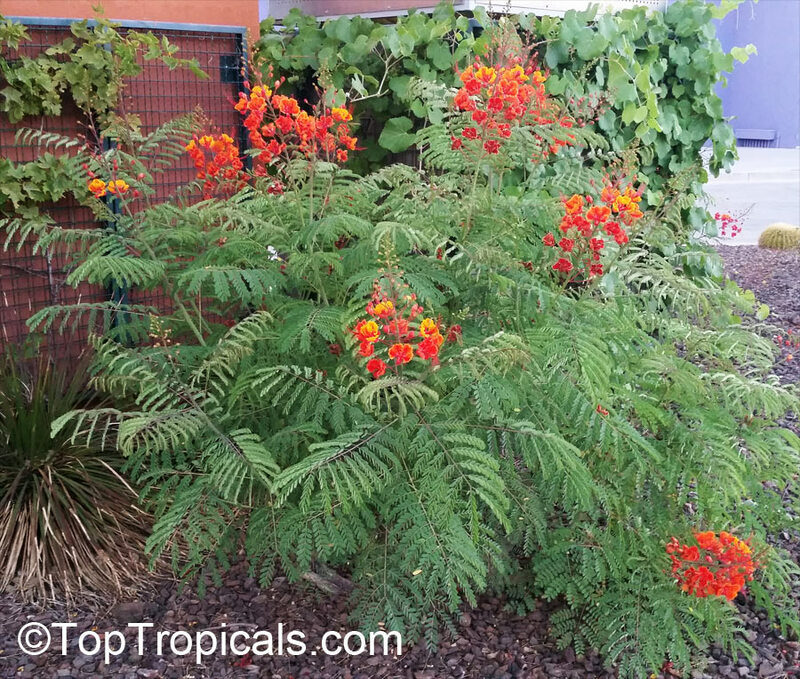 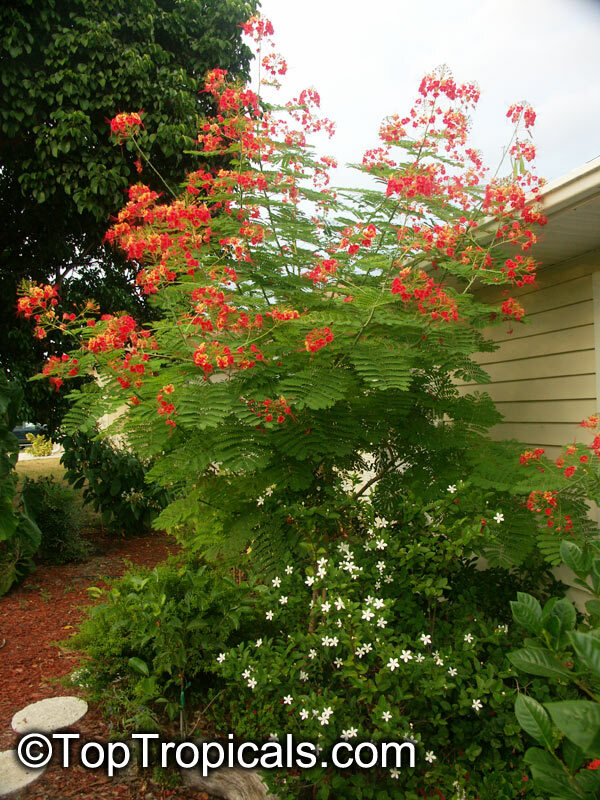 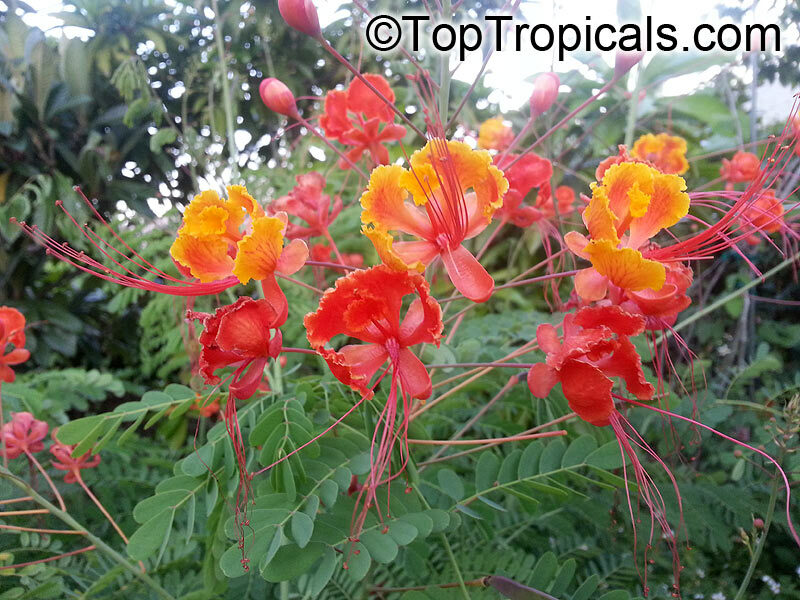 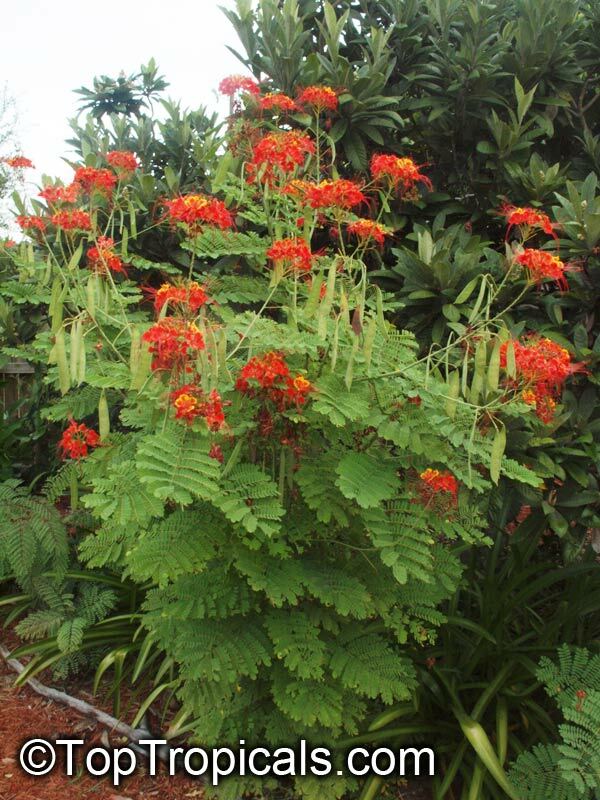 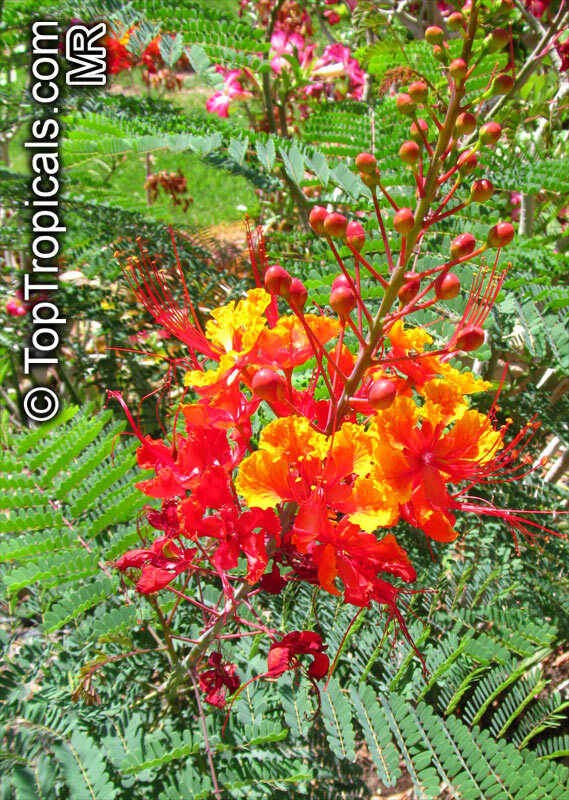 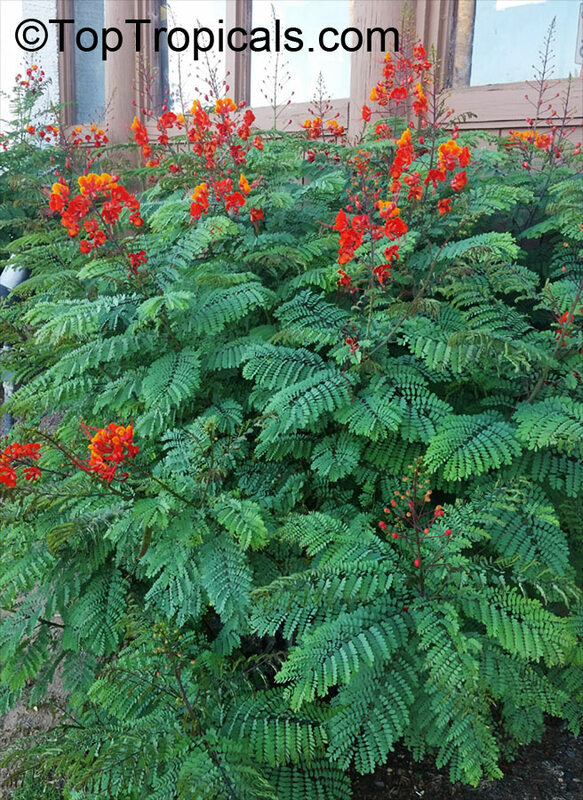 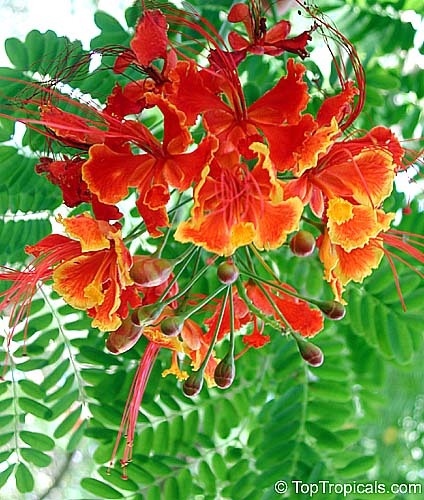 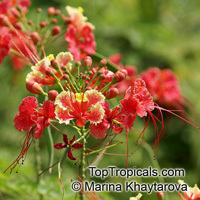 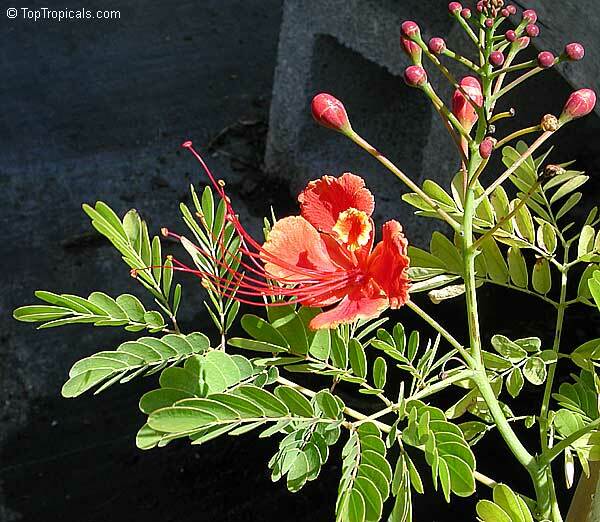 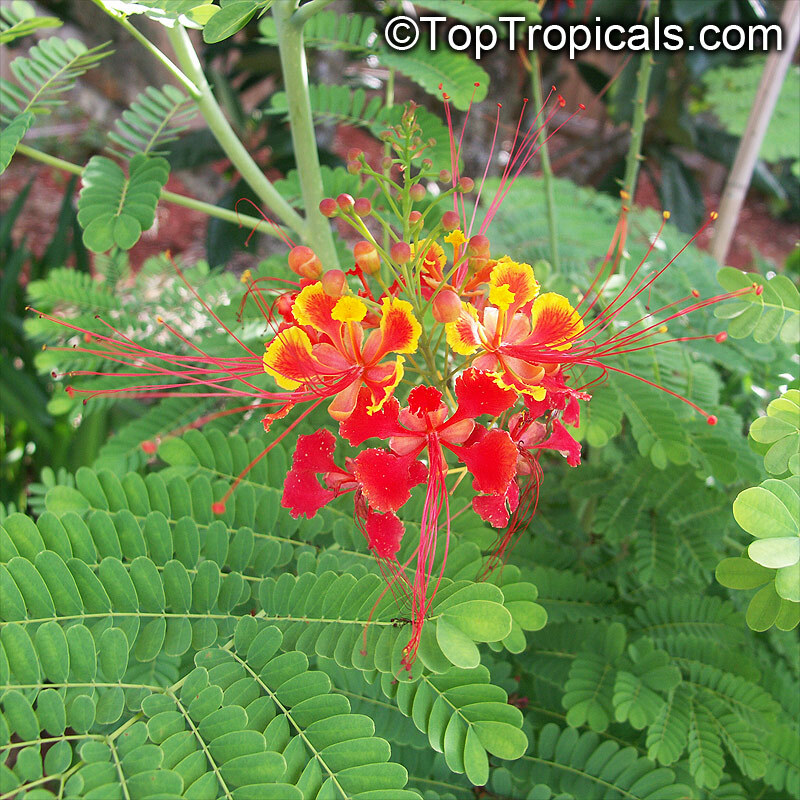 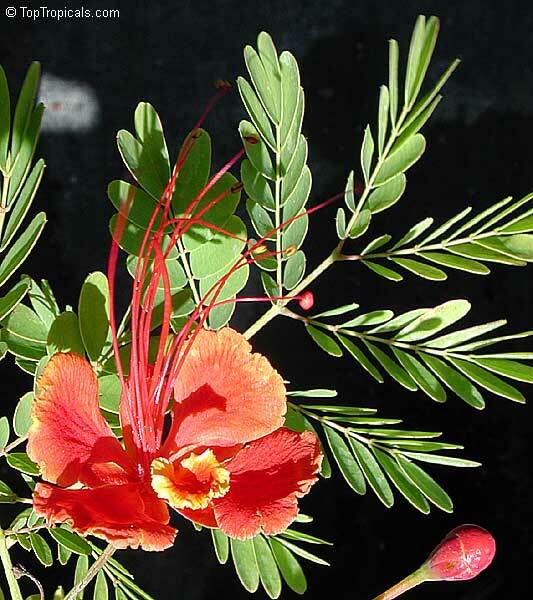 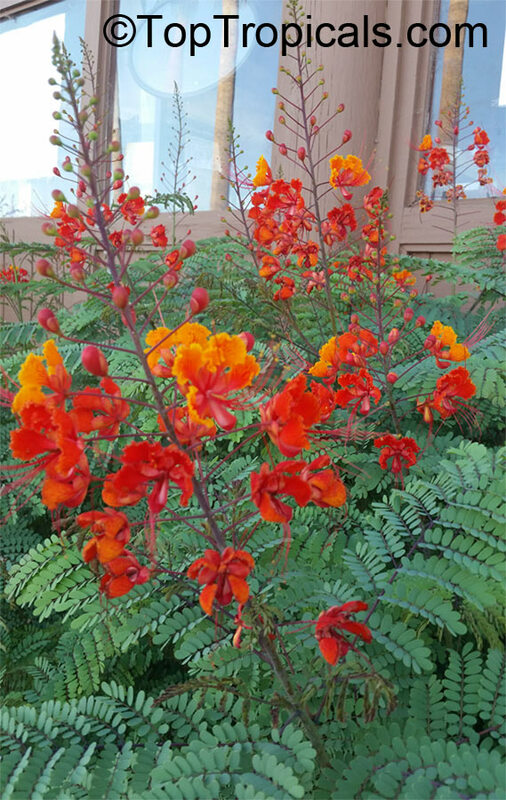 Peacock flower, Dwarf Poinciana. 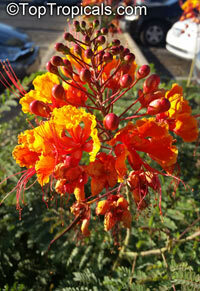 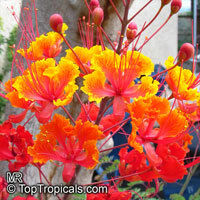 Peacock flower lives up to its name with incredibly showy blossoms of orange and red. 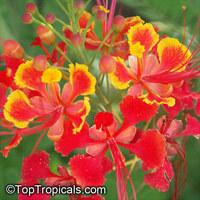 The striking flowers are an attention grabber! Soak seeds in warm water for 24 hours. 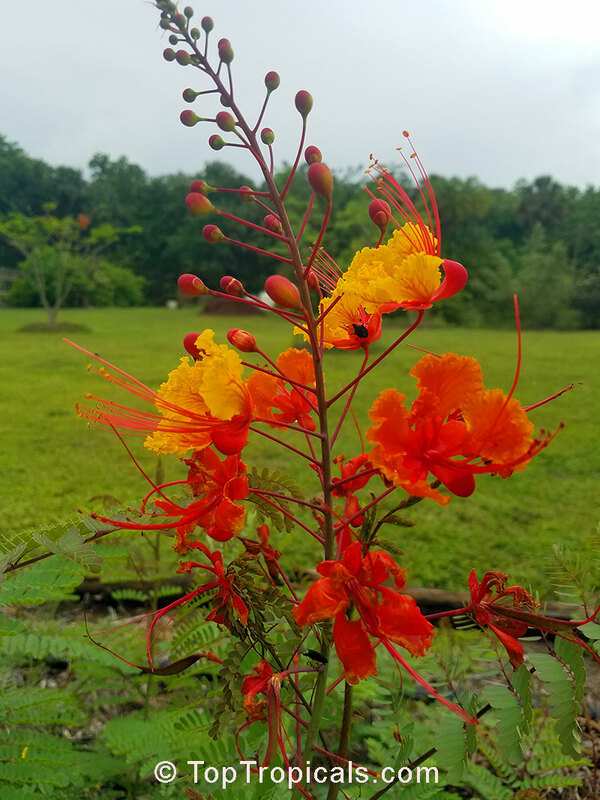 Plant 1" deep. 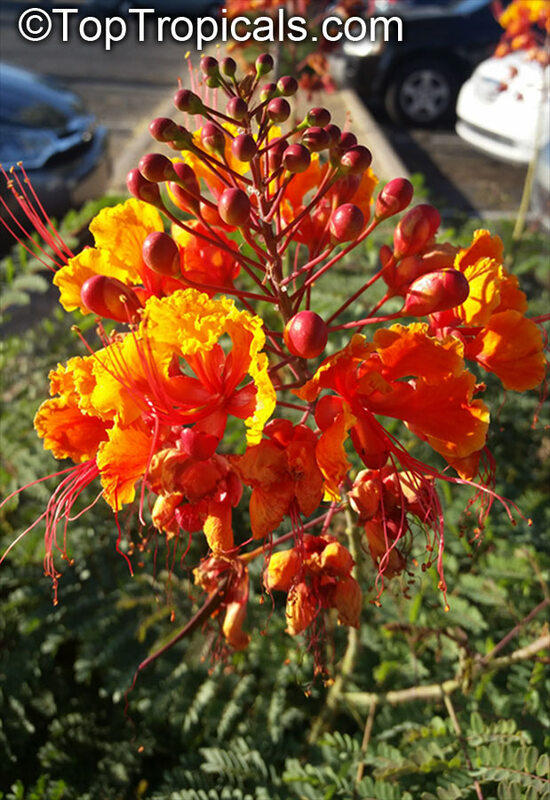 Bright light.